It goes without saying that there are as many ways to organize, manage and store stitching threads as there are stitchers. That however, doesn't stop questions both to TalkTemari and to me personally, about "what's the best way?".... There is no one best way, but here are some suggestions and example that may help, especially if you are fairly new to managing your stash (and welcome to "Ye who dies with the most threads wins"). There are two main goals in storing and managing thread supplies - keeping threads organized while you work, and keeping the rest of your supplies protected and tidy so that you are well organized and can find what you want when you want it. Yes, I know... but we do try; it does help and can work. Again, it all goes to personal quirks - some of us are neat as pins, and others have the most wonderful mishmash of bunches of skeins all mixed up in a huge bag that only they know how to wander through, but they do. There is no one answer, no one right way. And you'll probably wander through different ideas until you do find one that works best and most comfortably for you. Here are some suggestions and tips, and after many years trying almost everything under the sun, the I think the best thing I can suggest is "keep it simple". What to do when you open or start a new skein of pearl cotton? The first thing is don't stock up on DMC StitchBow inserts - they are made for floss skeins, not pearl cotton skeins (they are different loop lengths). The second thing is don't throw away the label with the color number on it, or you might have a long search in the future trying to match it. You can keep the skein intact as a skein, or you can wind it off onto secondary storage bobbins. The photo below, left shows both options. Bobbins are widely available and inexpensive, located usually right along side the pearl cotton and floss skeins in the store. They are a bit over an inch square, and will fit neatly into many of the prefab plastic organizer boxes that now are available in oodles of configurations for long-term storage. The bobbins come in either plastic or cardboard, plastic being much more durable and resusable. There is a space to write the name and color number on the header or footer with slits to keep the thread ends. Holes let you gather them into organized bundles for either project management or long-term storage. Binder rings found in office supply stores (they are also sold as stitching accessories but the office stores are usually less expensive) work great to hold project sets. Another option are the oblong rings which are sold as shower curtain rings, or for key organizing. I put the colors together on a ring for a given project, which makes it easy to keep things sorted and to "grab and go" as needed. Bobbins, of course, do mean winding an open skein onto them (this is how I manage most of my Pearl 5 and 8). Sometimes a floss box will come with a little winder attachment, but it's difficult to control tension and neatness with them. Better to just put the skein over your knee and wrap to the bobbin, doesn't take more than a few minutes. If you can't abide winding off to bobbins, there are some other options. However, whatever you do, always label the color (and thread name if it's something out of the norm). You can put the label on the bobbin and wrap over it, and/or write the info on the bobbin header itself. The skein can be kept in hank form. One option that is surprisingly popular, is to open the skein and cut the full loop of thread once, so that you have a bundle (split hank) of threads now all the same length. Slide the label with the color number onto the hank, then fold the hank in half, and gently twist it and fold it again. The hank will gently twist on itself. Or, rather than twisting, loop a half-hitch knot in the middle. The hank can then be hooked on any one of several ring options (photo, right). You'll be able to gently slide/pull one thread at a time out of either option to work with as needed. The downside to cutting the hank is that, while you have working lengths for stitching, they are not useful if you want to work wrapped band designs that require longer lengths of working thread. The two lighter gold colored skeins in the photos above show these two options. Both of these options can be used while still keeping the hank in full loop, as shown with the darker copper colored skein. Skeins wound off on bobbins are also shown. Rings can be either the standard binder rings from office supply stores, or key rings/shower curtain sliders from the hardware store - both of which are less expensive than the same things being sold in needlework supply sections of thread and hobby stores. Many stitchers were using these tricks long before thread companies started packaging and selling them as their notions. The rings option mean you can organize colors on smaller rings, then hook those together on larger ones as needed. Smaller rings are handy to organize projects, as they keep the colors together for a project if you have more than one going at a time. Once the question of keeping open skeins under control is taken care of the next step is general storage. Again, there are as many options as there are stitchers - and in the latter years, home/hobby organization has blossomed into a huge industry. There are scads of plastic storage boxes in all sizes, shapes and configurations. Ditto craft organizer bags and totes. There is a standard divided box that usually appears in thread departments; check the beading sections for more. Don't forget art supply, office supply and hardware stores, fishing tackle departments in sporting goods stores, and home organization selections. Smaller boxes like these work great; one or several per type/brand of thread. If you are hanking on rings, they can be hung in color groups/order or placed flat in boxes. Other folks use tackle boxes (which come in fantastic setups and configurations), right on up to office organizer carts. It really depends on how much storage you have in your home, and what you have to work with there as well as how much traveling you do and how much stuff you want to haul. The great thing about temari is they are small portable projects, so once you have chosen the threads you don't need to haul your temari life with you everywhere you go. Once you have things tucked into their places - be sure to label everything. No matter how much we think we'll remember or recognize it later, it just doesn't work. One of the best things investments that can be made is a hand-held label printer, found in office supply stores. It can be used to label thread boxes, larger storage boxes, drawers, etc., and as well as id your books and add English information to any Japanese books. For storing larger quantities, larger skeins, threads on cones or in balls, backup supplies, etc. as well as related supplies, the simple simple video/photo storage boxes that are available from hobby/craft stores are wonderful. They are a perfect size to stack and organize, are large enough to be useful but not too large to be clumsy and not fit in normal spaces. They are inexpensive, come in a wide variety of colors and designs if you choose, and have an attached label holder. 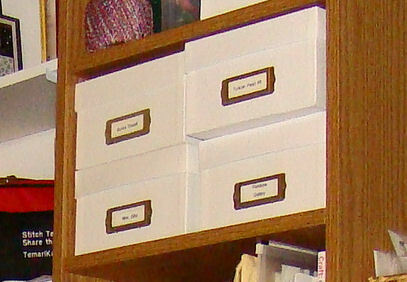 Staying organized is not just about storing threads. We all have our favorite tote or work bag of some sort, but something that is rarely thought about is a work area, especially if you are stitching away from home. Granted, most of the time a lap works just fine, but the small unfinished wooden trays or boxes in craft and hobby stores, as well as the organizing sections of home goods stores, are great. I have several trays that I use as project trays for just about any craft I'm working on, not just temari. They are inexpensive, take up little room, travel easily if needed, and provide a sturdy, flat, stable space next to you or on your lap as needed. After seeing and hearing about these, many folks that come to the stitching gatherings now have a small tray or something similar in their work bags. They do help to keep everything together as well as not getting mixed up with another person's supplies. The tray on the bottom in the photo measures about 11 inches by 7 inches (about the size of a Japanese temari book).... keeps everything tucked in neatly no matter where one is working, and easily slips into a work bag or tote.